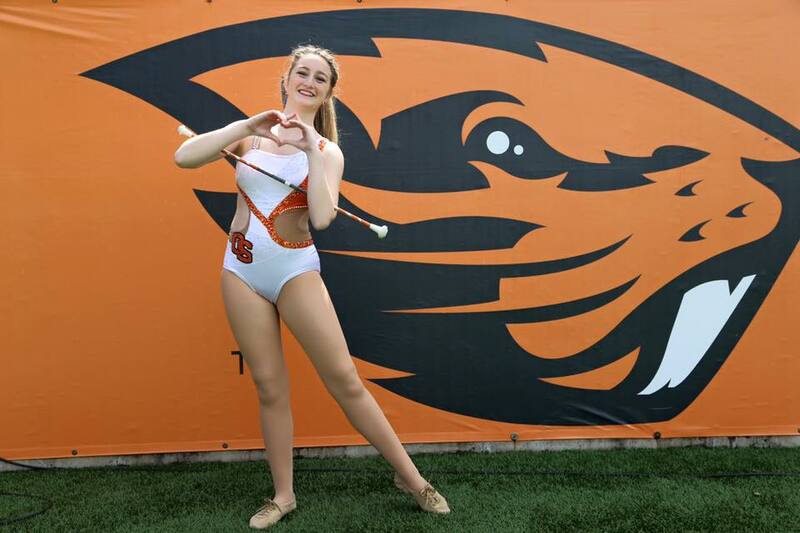 Today’s #TwirlerTuesday features Danielle Cormier, feature twirler for Oregon State University. She’s here to share how making your dreams come true is not always the straight path that you imagine - sometimes it takes a couple bumps and swerves along the way to get to where you are meant to be. Read Danielle’s story and remember, perseverance and dedication to your dreams can make all the difference! Hello! 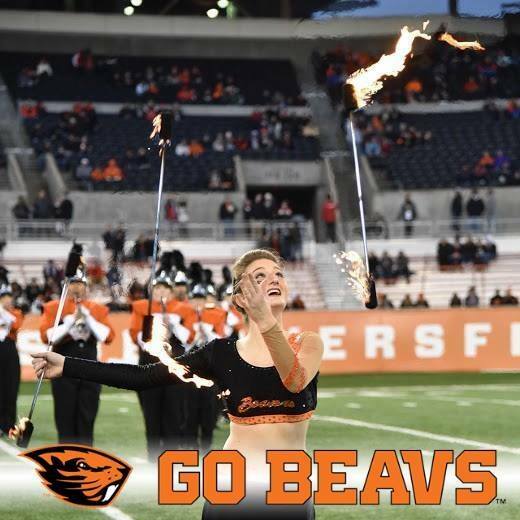 My name is Danielle Cormier and I am so unbelievably blessed to be a Feature Twirler for Oregon State University and The Spirit and Sound of OSU (Go Beavs.)! 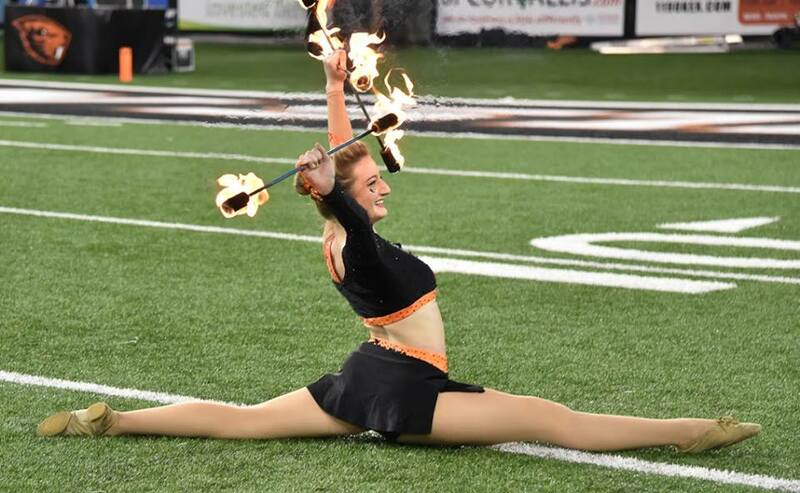 I have been twirling since the age of three, following in the footsteps of my older sister Courtney (Feature Twirler for The University of Tennessee 2007), and have moved all around the country under the direction of many different coaches and teams. As you may be able to imagine based on my past, I had always dreamed of attending a big university and have the ability to call myself a feature twirler, just like my sister; but, it wasn’t as easy as I had intended. Of course, like any other high school student, I had my eyes- and heart- set on one particular school. I visited this school time after time, befriended all of the majorettes and feature twirlers, and even got to shadow the band multiple times. I was excited. I sent in my application and anxiously awaited the day I would receive my giant letter in the mail with the three words I had always dreamed of: “You’ve been accepted!” Little did I know how disappointed I would be when that day finally came. Now, to those who have been denied from a school, you know exactly how it feels. To those who don’t - I can’t even begin to describe the amount of heartbreak you feel. Nothing is more disheartening than setting your sights on something and knowing you’ve come up just short of your dream. I decided to I shake it off. It was coming to January and I needed to make a decision in just two short months if I wanted to be a part of a marching band as well as go to a great college. My coach, Lori Cobb, told me about another school that was a state or two away that I should really try - so before I even toured, I sent in my application. Not even two weeks later, I received my letter: I was in. While wiping the sweat from my brow, I sent the band director an email and asked if I could meet with them when I went to tour the school. The answer was yes, and I was set to go. Now, with the other school out of my brain, I fell in love with this school, had an awesome interview with their band director, and handed them my twirling highlights. I thought I was set. So I waited…and waited…and waited. And a half a month before I needed to make a decision I had my answer. I finally received my email I had been waiting for with the subject: “Feature Twirler Position.” I took a deep breath and opened it. I read it again and again. I couldn’t believe what I was reading. I thought the hard part was over. I got into the school- and I thought I was good enough to twirl there too. This time I was even more heartbroken and didn’t even leave my room for the rest of the night. I felt as though I was not good enough to be a student or a twirler. I was on the verge of giving up and going to a small school near home and never picking up my baton again. Watching all of my twirling friends get into their dream schools and become feature twirlers made me feel like I was near worthless. But I had to make a big decision soon and I had one choice that I had barely even considered. Back in October of that year I went and toured a school I had once dreamed about going to - Oregon State University. And let me clarify, it wasn’t that I didn’t want to go anymore, it was that it was so expensive to go out of state that I had allowed that dream to die a few years after I had found it. But, my mom insisted that we check it out, meet with the band director, and that I at least apply. It was the first school I got a reply from, and they told me I was accepted. It was a happy night in the Cormier household knowing I was- for sure- going to college. Fast forward to January, about two weeks after being denied from my first choice, I received an email from the band director subject: “Feature Twirler!” I read the email and was so excited to know that I was accepted not only as a student, but also as a twirler; However, I still was on edge about moving all the way from North Carolina to Oregon. So I had put it at the bottom of my list, despite my coach and parents encouraging me to attend. So as I’m lying in my bed, distraught over my most recent heartbreak, I was left with two choices: go to my backup school or go across the country to OSU. And two weeks later I had my final decision. I was Oregon bound- and there was nothing and no one getting in my way of that. I was determined to live up my dream and go to an amazing school at the same time. What really pushed me to make my decision was the thought “this is a once in a lifetime chance.” I was not going to give up everything I had been working on to end up at a small school with no marching band or twirlers and never be able to one day tell my kids about how my dreams came true- even if that meant taking a huge risk. Today, I couldn’t imagine myself anywhere else. Oregon State has welcomed me with open arms and become my home. It truly feels like I was meant to be right where I am- that it was all in The Plan. The moral of my [longwinded] story is, when God closes a door, and then a window, sneak out the vents and you’ll find a magical place. College is already hard enough to get into, and trying to be a twirler only adds to the stress. But in the end, it all works out- I promise. So follow your dreams wherever they may take you- because saying that you climbed over numerous obstacles to reach them only increases the triumph.